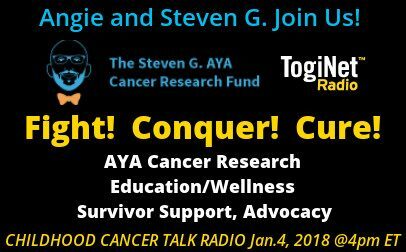 Two-time cancer survivor Steven Giallourakis joins us with his mother Angie to share their experience which inspired the Steven G. AYA Cancer Research Fund in Avon Lake, Ohio. Angie Giallourakis is President of the organization which has programs in wellness, education, research and advocacy for young people with cancer. "AYA" is an anacronym for "Adolescents-Young Adults", a patient population faced with unique challenges including inadequate research funding, poor prognosis rates, and lingering medical issues for survivors. 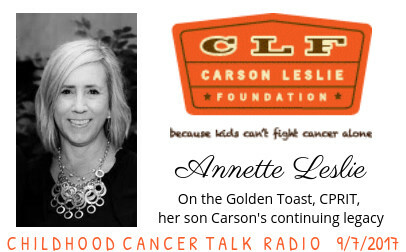 Angie's work has developed strongly into an exploration of healing and holistic living and wellness practices for patients and their families, while Steven and his advocacy for young people with cancer remains the inspiration and driving force of their organization. Steven lives with the same challenges facing many other survivors; his experience speaks to the importance of the STAR Act and other similar pieces of legislation needing greater public awareness and support in Congress. Candidly, Steven shares with us some of his own personal experiences with loss which inspire him on a daily basis to fight for other young people with cancer. 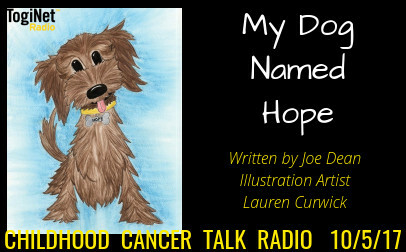 The new children's book "My Dog Named Hope" is about a special girl, her amazing dog, and a family's journey through childhood cancer. The story was based on a compilation of the experiences of many childhood cancer families by the author, Joe Dean during his time working for the US Senate; the book was illustrated by Lauren Curwick. Joe was a business executive as well as an executive US Senate staffer and founded the Stars and Stripes Honor Flights for Veterans of War. Joe joins us to discuss why he is so passionate about children with cancer and why he decided to write this book, the proceeds from which benefit pediatric cancer research and support. 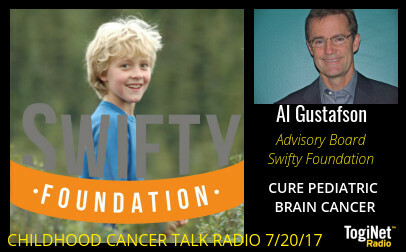 Al Gustafson is on the Advisory Council of the Children's Brain Tumor Tissue Consortium and serves on the Board of Swifty Foundation, among several others; in addition to his work in ministry, Al is the president of the Gustafson Family Foundation, a private foundation promoting the development and education of young children at risk. 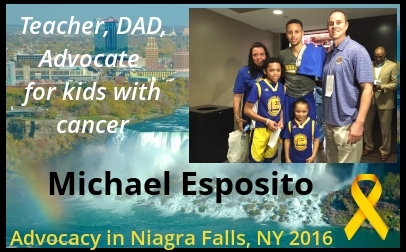 His son Michael was diagnosed with medullablastoma which unfortunately recurred after treatment and a declaration of having been cancer free; he knew he would not be here long, and succumbed to the disease in 2013. He shared with his family his excitement at the opportunity to donate his body to science after much introspection as to what his life meant after his prognosis was certain. His vision, to cure brain cancer, and the name Swifty defines the Foundation that has arisen and flourished as a result of his ultimate sacrifice. Not only is Swifty Foundation successful at raising funds for pediatric brain cancer research, they are designing a program which facilitates urgently needed tissue donation for research. This much-needed program shows promise of having greater implementation on a nationwide basis, and further facilitating the research so urgently needed to save lives. Caitlin joins us with her mom Kelly to update her progress since treatement for BPDCN, Blastic Plasmacytoid Dendritic Cell Neoplasm, a rare and aggressive form of leukemia. Caitlin describes as best she can her experience with chemotherapy, radiation, bone marrow transplant, and the tough decisions a very young girl has had to make with her family. Caitlin's grace and sense of hope is inspiring; she is truly a force for hope, compassion, and purpose in the world today. She is currently selling t-shirts to help give back to the all-to-often-forgotten teenagers at the pediatric clinic where she was--with special cards and age-appropriate items for them. 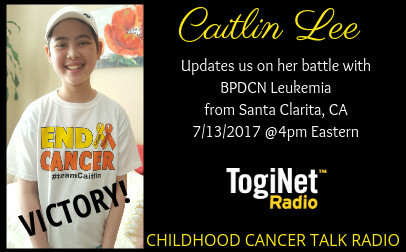 Caitlin is the 3rd child so diagnosed in the United States and the first known survivor. We look forward to Caitlin's next update! "Eight years ago, a 15 month-old little boy with platinum blond ringlets and bright blue eyes was diagnosed with high-risk neuroblastoma, a childhood cancer that results in around 255 deaths/year in the United States. Based on the size, location and maturity of his tumor, the toddler had less than 50% chance to live long enough to attend kindergarten... 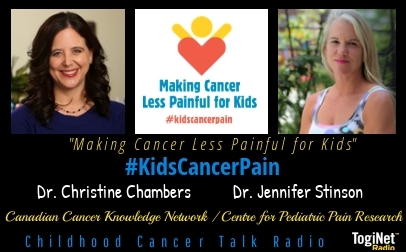 Unlike most parents of children newly diagnosed with cancer, these parents were armed with decades of knowledge and experience in working with very same drugs that their son would receive intravenously. 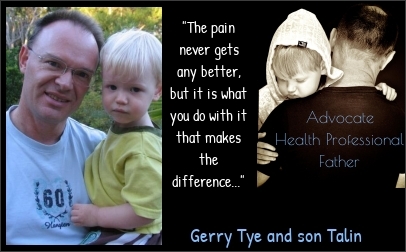 They knew about genetic markers and how these markers could predict their son's prognosis and response to these drugs. Even though the biopsy indicated the child's cancer was extremely aggressive, a genetic marker suggested otherwise; today he is a 13 year-old with no evidence of disease..."
The Nicholas Conor Institute was founded out of the parents sheer frustration of knowing that existing technology and academic discoveries are not being further developed to save the lives of other children with cancer. Beth Anne Baber, CEO, joins us to share her son's story and to discuss this incessant and gnawing motivation for many parent-advocates: Why are existing technology and academic discoveries not being further developed for our children, adolescents and young adults? The answers are clear, and with increased activism and awareness of the realities so many children and their families are expected to endure, the solutions are visibly on the horizon for the childhood cancer community. 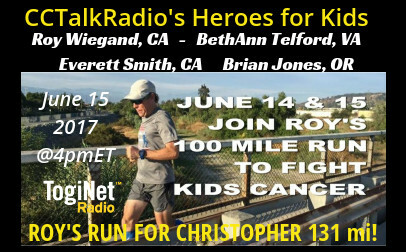 Live from Roy's 100 mi Run for Christopher in Santa Clarita, CA, Roy Wiegand joins us for news on his progress, the support of the local community for his efforts to raise funds for the Michael Hoefflin Foundation. We are joined by BethAnn Telford, veteran of the World Marathon Challenge, to support Roy and to hear about her accomplishments and challenges, with conversation between runners, with potential planning for events in the next year. 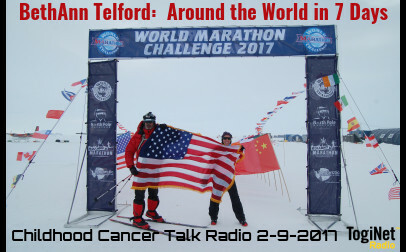 Everett Smith of Redlands, CA then joins us to report on his Appalachian journey with Tony Stoddard, legendary childhood cancer advocate and endurance athlete. Everett has initiated several endurance events benefiting pediatric cancer awareness and research, with his Appalachian trek benefiting Sophia's Fund at sophiasfund.org. 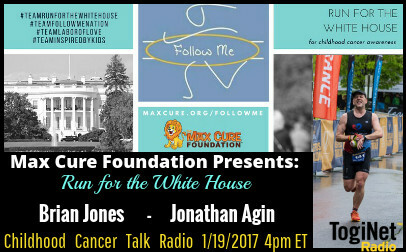 Last but not least, we finish our heroes' round table with Brian Jones, founder of the Run for the White House event, which this year began January first and continues through September 17, the date of CureFest. 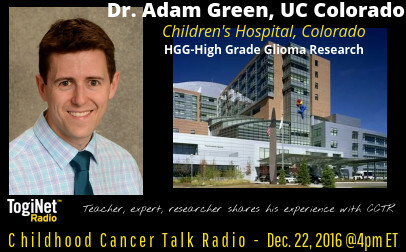 He talks about the recent merger with MaxCure Foundation for a dynamic new start, and we discuss navigating the current political climate for our common cause of raising awareness for the urgent need for pediatric cancer research. 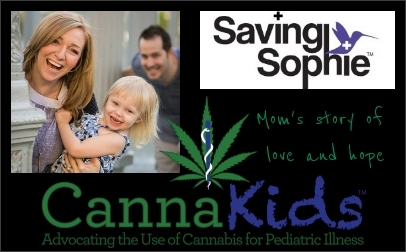 Sophie Ryan, daughter of Founder and CEO of CannaKids Tracy Ryan, inspired the birth of CannaKids. Sophie was diagnosed at 8 1/2 months old with an extremely rare brain tumor called an Optic Pathway Glioma; after using cannabis oil in combination with her chemo protocol, Sophie's tumor shrunk by over 95%, a tumor for which doctors said minimal shrinkage would be a best-case scenario. Doctors also said Sophie would have partial if not complete blindness with zero chance of saving her vision. After successfully keeping most of her vision intact, Sophie has become a medical miracle. Tracy and her team at CannaKids have recently entered into collaboration with the Technion Institute in Israel where they are legally studying the effects of cannabinoids on many cancer types. CannaKids is sharing all of their patient data that they have been meticulously collecting. In addition to the research in Israel, CannaKids is in the planning phase with a major hospital in California and is expected to start in-hospital clinical trials on pediatric patients this year. Professionally, Theresa Beech has had 20 years of experience as a space engineer designing satellite mission ground systems. She has worked as a ground systems engineer, technical lead, subject matter expert, and program manager for a wide variety of satellite ground systems around the world. 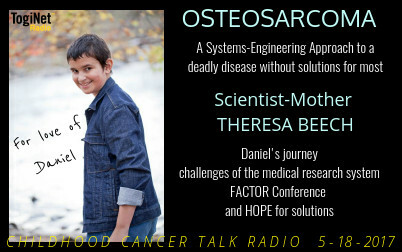 She comes to Childhood Cancer Talk Radio with the story of her son, Daniel, who's battle with osteosarcoma ended his young, beautiful life, and left his mother determined to find solutions for this devastating disease. As with the deadliest of pediatric cancers, there have been no innovations for osteosarcoma nor progress in survival rates in over 30 years. What makes this story so important is not only the devotion of this mother, her talent and intelligence, but her genius in applying her knowledge of systems engineering to osteosarcoma genomics-- no small feat. The result of this personal research gives new leads to greater biological understanding of osteosarcoma as well as potential solutions for treatment. 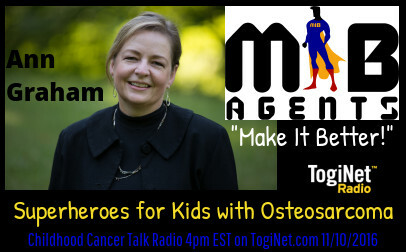 Write to osteoregistry@gmail.com if you are an osteosarcoma patient, parent, or researcher for more information. 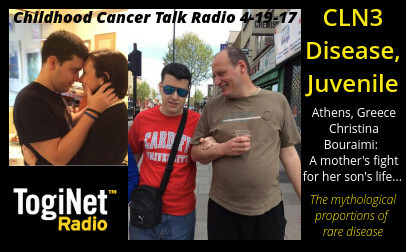 Christina Bouraimi (mother) and Nick Maroulis (nurse) join us on CCTalkRadio from Athens, Greece to tell the story of a brave young man Theodore who lives day by day with progressed symptoms of Batten Disease, CLN3. There are 10 identified types of Batten Disease, which is itself one of approximately 50 diseases called lysosomal storage disorders (LSD), meaning that genetic mutations disrupt the cells ability to dispose of wastes. With Batten disease, cells are thrown out of balance with the build-up of proteins and lipids (fats). Because of these damaged cells, patients with Batten disease suffer progressive neurological impairment, which includes seizures, visual impairment/blindness, personality and behavior changes, dementia, loss of motor skills and the ability to walk, talk and communicate. The arc of Batten disease can vary tremendously for each person due to widely varying genetic mutations; until more progress is made in research and treatments, Batten invariably results in an early death. Christina describes the fairy-tale like joy of life prior to Batten, and the nightmare that ensued as her youngest of two boys went through the journey of diagnosis with Batten Juvenile CLN3 at the age of 6, which was unknown in Greece at the time in 2002. They received diagnostic news from U. Rochester in the United States, from Finland, and Germany to fully understand the scope of the illness. Theodore lives now a rich and well-scheduled life, enjoying music, political conversation, and following sports despite his loss of sight, cognitive and emotional challenges, and the threat of a deadly prognosis. 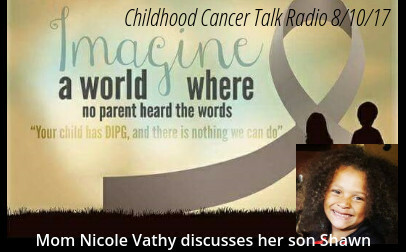 Christina's resolve to fight for her son in the difficult financial climate characteristic of life in Greece, and Nick's compassion for the boy's desire to live fully without question earns them the "Hero of the Week" title on Childhood Cancer Talk Radio; we salute Theodoros! In the United States, visit www.BDSRA.org for more information about the Batten Disease community, clinical trials, current research, and support. In the UK, www.bdfa-uk.org.uk/; currently there are no support systems for the afflicted nor is the disease recognized to allow State provided medical assistance. 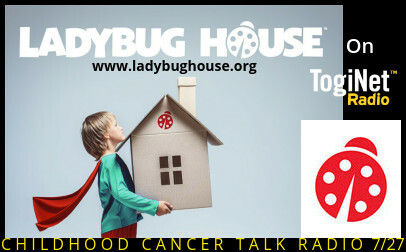 Childhood Cancer Talk Radio is reaching out to the greater global community for financial ingenuity and assistance for helping families like Theodore's in a country where gofundme and other such platforms for crowdfunding do not operate. Please contact cctalkradio@gmail.com to forward helpful information or financial arrangement proposals for the family. Thank you! 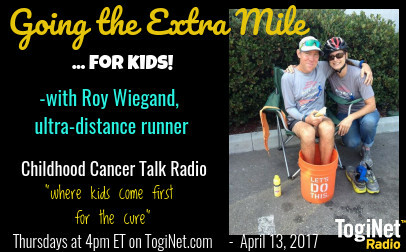 On April 13 2017 Childhood Cancer Talk Radio interviewed Roy Wiegand of Burbank CA, suburb of Los Angeles, a local free-lance musician with an evolving career as ultra-distance runner and advocate for children with cancer. Roy began running later in life in his early forties, and has been "ultra-running" for about 7 years now, prompted initially by his association through his church with an Ethiopian gentleman who was visiting to raise awareness for the urgent need for clean water access in his native country. This inspired his church to host a 100-mile bike ride with Roy leading the effort to make this event a staple fundraiser for the charity Lifewater, and challenge to riders with at 12,000 foot gain in elevation for the event. Running for causes came naturally to Roy so that when he came across the Wilke family and their son Christopher, a boy-scout friend of Roy's son who had been diagnosed with a rare form of cancer with little hope for survival, he was inspired to run and raise funds for the local foundation supporting the Wilke family in their struggle. The Michael Hoefflin Foundation in Santa Clarita, CA, supports local families fighting childhood cancer in Southern California, and Roy has now run to raise funds for the foundation for the past four years. June 14th 2017 he will run his fourth ultra-distance run, this being 131 miles-his longest run yet-to support the Michael Hoefflin Foundation. 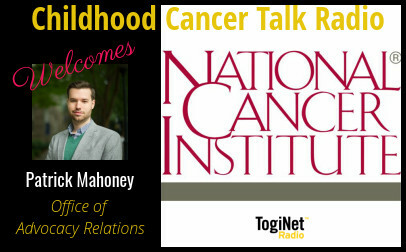 Childhood Cancer Talk Radio interviews Patrick Mahoney from the Office of Advocacy Relations (OAR) at NCI. The March 16 discussion included a brief history of the National Cancer Institute, it's role as a scientific research institution as well as resource of support and direction for millions afflicted with cancer. "We want people to contact us...let us know their greatest concerns to better represent public interests in cancer research..," he sustained, sharing examples of public input affecting research and eventual solutions where there had previously been none. Host Janet Demeter ensured the conversation included the "dreaded" 4% issue-gladly addressed by Mahoney, bringing to the forefront the current challenges in medical research and also the recent efforts of advocates which have had a definite impact on the course of research and the importance of pediatric research at NCI, keeping the discussion to a collaborative and jovial spirit, and an optimistic outlook for pediatric research at NCI. The National Cancer Institute remains the greatest contributor to the field. 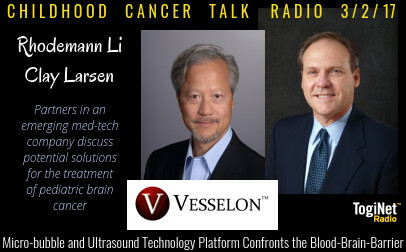 Rhodemann Li and Clayton Larsen, co-founders of Vesselon describe the unique blending of two technologies into one platform effectively solving the problem of the blood-brain barrier in treating brain cancer. Using ultrasound and micro-bubbles, the future of pediatric brain cancer treatment could include a simple hand-held device enhancing the delivery of medication to the cancer, even the most difficult to treat diffuse intrinsic pontine glioma. Li an Larsen describe the pre-clinical investigations and the other tried-and-true clinical uses of both microbubbles and ultrasound in treating other areas of the body, for the heart, for instance. This innovation for the challenge of the blood-brain barrier will be developed for treating not only brain cancer but Alzheimers and other neurological diseases. The technology would allow delivery of medicine for large and small molecule treatments alike, including genomic therapy, enzyme, and immunotherapy as well as standard chemotherapy treatments. Advocacy news includes the introduction of the RACE for Children Act, the STAR Act, and the National DIPG Awareness Resolution. 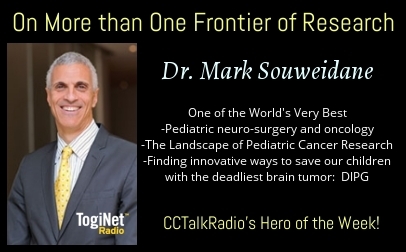 This technology newly developed to treat brain cancer is music to the ears of all affected by pediatric brain cancer, the leading cause of death in children with cancer. Li and Larsen are currently engaged in finding quick solutions to bringing this technology to the market for expedient accessibility, and to support the development of new and hopeful therapies for clinical trial. 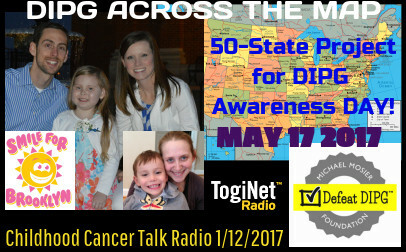 Jenny Mosier, Executive Director of the Michael Mosier Defeat DIPG Foundation joins us to discuss a 50-State Project for DIPG, calling for volunteers in as many states as possible to work for a gubernatorial or state legislature proclamation for May 17 2017 DIPG Awareness Day. 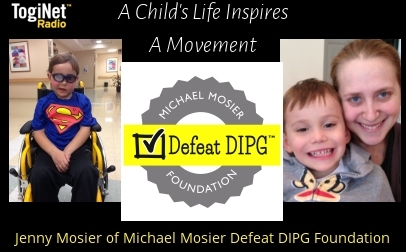 The 2017 National DIPG Awareness Resolution will be introduced by Congressman Steve Knight (R-CA-25) in the US House of Representatives on January 30, 2017, designating May 17 also for a cohesive effort of Jack's Angels Foundation with Michael Mosier Defeat DIPG Foundation's DIPG Across the Map Project for DIPG Awareness. The nationwide project has over 30 states participation so far; joining us also, from the perspective of a DIPG family currently battling the realities of the disease for their daughter Brooklyn, is Nicholas Smith of Ohio. Keren Beukema of California, who lost her son Vincent to DIPG last July in a swift and devastating blow, lends her perspective to the importance of the project. Lawrence Fagan, a retired technology and medical researcher who learned of DIPG's deadly existence through the experience of others, gives critical information regarding the importance of larger, collective awareness for the disease nationally. We may be witnessing the critical point between suffering and the proactive movement towards a solution and the momentum necessary which needs no further case to argue for change. DIPG stands for itself, and makes a precedent-setting testimonial for the deadliest childhood cancers for which research has been, historically, neglected due it's small numbers and silent constituency. Keira's uncanny zest for life and love for her friends and family continues to light up the lives of all with whom she meets. 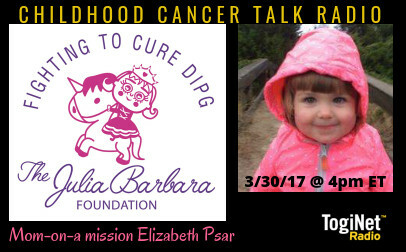 CCTR intereviews Marisa Martinez, mom to Zamora Moon, a little 9-year old girl battling DIPG, diffuse intrinsic pontine glioma, arguably one of the deadliest cancers which is almost exclusively pediatric. 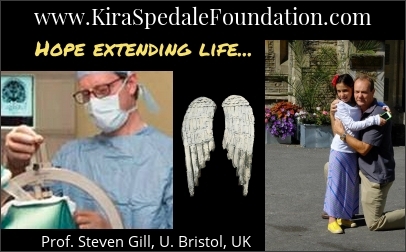 Her pioneering journey into the unknown includes treatments in Germany and the UK. Lisa Spedale, who's daughter Kira was the first child in the United States to undergo CED surgery and treatment for DIPG, joined us with compassion and perspective. Our prayers for steadfast determination for brave Zamora continue as we follow her story. CCTR interviews Caitlin Lee (12) and her mom, Kelly about Caitlin's recent diagnosis with BPDCN and course of treatment. Blastic plasmacytoid dentritic cell neoplasm is a rare, especially among children, acute leukemia subtype with no therapeutic protocol because it is so rare and newly categorized. Stories of hope and unparalleled strength are tempered with the pending realities of a bone marrow transplant...stem cells, and a baby donor's umbilical cord. Caitlin is a gifted student with scientific aspirations. We will be following her story with high hopes for a complete recovery. Author Sharon Wozny shares with us her first book for children facing the difficult emotional challenges of having a sibling with cancer and the effects of this on the family. Inspired by her volunteer work with the Children's Cancer Network in Chandler, AZ, Sharon describes the experiences she had as a teacher for 30 years and with the organization which helped her craft the book which is half story, half creative journal. 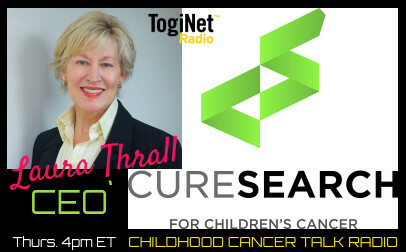 Patti Luttrell, Executive Director of the Children's Cancer Network, joins us to explain how this and other works of the organization help local families. "Jaime's Journey" can be purchased on Amazon.com, and there is more demonstrative information about it on this Youtube link. Visit www.childrencancernetwork.org to learn more about the Children's Cancer Network. 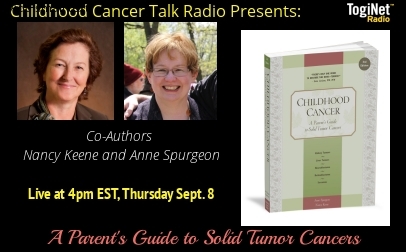 CCTR interviews Nancy Keene, well-known writer and advocate for children with cancer, and co-author of the Childhood Cancer, A Parent's Guide to Solid Tumor Cancers. Her work has appeared in publications such as Reader's Digest, Journal of the American Medical Association, Exceptional Parent, and Coping Magazine. 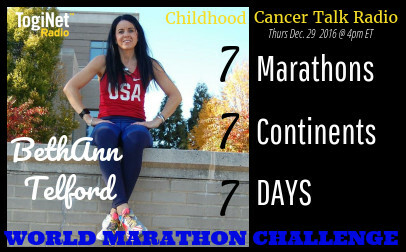 Co-Author Anne Spurgeon founded, and worked as executive director for, the Badger Childhood Cancer Network in Madison WI. Both ladies are mothers of childhood cancer survivors and are dedicated to serving the Childhood Cancer Community in finding the services they need with the support they deserve. 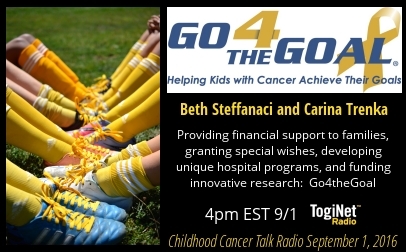 CCTR interviews Beth Stefanacci and Carina Trenka of Go4theGoal, a dynamic support organization for children with cancer based in Cherry Hill, NJ, and one of the beneficiaries of the historic "Golden Steps for Pediatric Cancer Awareness Walk." The walk led by Baby Shawn who is a local young hero in Niagara Falls, NY, currently battling DIPG, commemorates the momentous occasion of the Niagara Falls "going gold" for childhood cancer awareness. Go4theGoal helps kids with cancer achieve their goals, supports cancer families, and also supports local institutions which care for children with cancer. Midway through the show, our host received a notice from the Office of Science and Technology Policy with the following attachment: 2016childhoodcancer.prc.rel President Obama's Childhood Cancer Awareness Proclamation 2016 had just been signed, and it was read on the show. 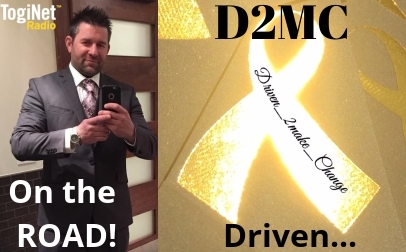 In our final segment we were joined by "Driven Change", Ronnie Duvall, Childhood Cancer Awareness activist more than half-way through his 50 state journey. 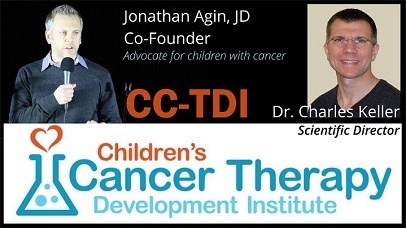 CCTR interviews Jonathan Agin JD, father of Alexis who perished to brainstem glioma in 2011 and 4 other young children, and official counsel and co-founder of the Children's Cancer Therapy Development Institute. 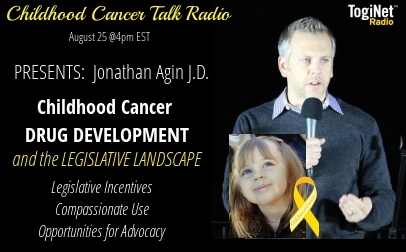 One of our country's foremost advocates for children with cancer, Jonathan describes the complexity of our medical research system and the challenges to funding pediatric cancer research, and the importance of advocacy. PREA, the Race for Children Act, and the Childhood Cancer STAR Act are among the pieces of legislation discussed, and their importance to progress with pediatric cancer research. 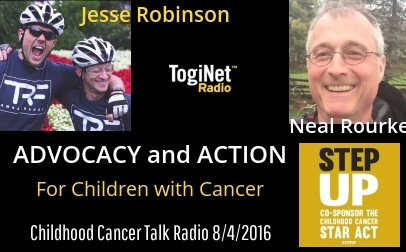 CCTR talks with Neal Rourke and Jesse Robinson about the Childhood cancer Awareness Movement and the upcoming September, Childhood Cancer Awareness Month. Lighting, "Going Gold", the Maggie Project, and Tyler Robinson Foundations's Project CANCO are featured. CANCO is a bike ride planned to begin Sept. 1 from Niagra Falls, Canada to Key West, FL for 2200 miles. Gifts of $10,000 will be given to needy families with a child afflicted with cancer along the way, for a total of $100,000. Action is underlined as being just as important as Awareness for changes to occur in the system to better accommodate our children with cancer. Driven 2 Make Change: Activism on the road for our kids! Today's show features Ronnie Duvall, "Driven Change" on facebook, one who truly walks the talk of his values. Ronnie gave up his job and home to drive all 50 states in his quest for greater knowledge in how to create an organization which will truly address the needs of children with cancer and their families. "Life is full of opportunities to make a difference; pick yours and never look back while being what you're meant to be." Ronnie's location will be a surprise as we connect this afternoon; for his most recent experiences, visit his page Driven_2Make_change on facebook. A true activist, he lives and breathes telling the truth about a medical research system which is directed by profit and not so much for saving lives, and he doesn't give up the fight to raise awareness for and change the meagre 4% afforded to childhood cancer research by the National Cancer Institute. CCTR's Hero of the Week! 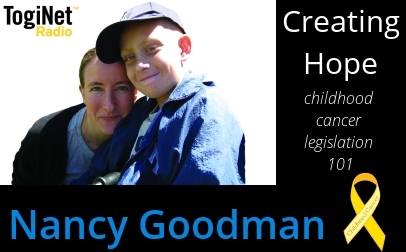 CCTR interviews foremost advocate for children with cancer, lawyer, and mom to Jacob, forever 10, 2009, Nancy Goodman. Nancy brings us news of the RACE for Children Act, a reform of the Pediatric Cancer Research Equity Act or PREA which she champions, and it's to go to both House and Senate 7/14/2016. Nancy is a true problem solver in her can-do approach to lassoing the pharmaceutical industry with incentives to support and fund pediatric cancer research. In her work, Nancy appeals to the intrinsic goodness of people who truly want to help children with cancer, yet are strapped by the system. In "finessing the system", solutions are found that support other proactive missions to prioritize pediatric cancer research. Also, inside news of the Washington DC Moonshot Taskforce Summit, and that Washington will host the first Pediatric Moonshot Summit, which was news to all of us. 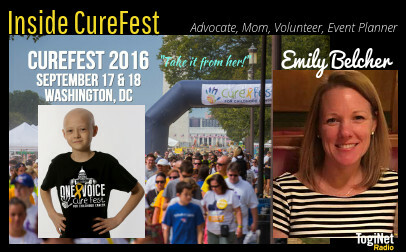 Good will, hope, and information on the 2016 Curefest and Summit for the Congressional Caucus for Childhood Cancer are featured. 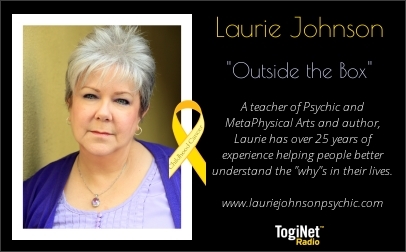 CCTR interviews Laurie Johnson, psychic advisor and teacher of the metaphysical arts, who addresses the issue of childhood cancer, and cancer in general and what that means in the greater scope of our reality. Karma, life lessons, re-incarnation, pre-lifetime agreements are included in the discussion, and also the importance of realizing there is no "fault" or "mortal moral cause" of cancer, a particularly troublesome topic for parents. Two examples of life situations for families of a child who was diagnosed and passed on were investigated by Laurie with her expertise and feedback for the parents. CCTR interviews Jesse Shumaker, a brave and loving dad who just lost his only child Madelyn 6 months ago to DIPG, the deadliest brain cancer with no survivors. Jesse founded the Nebraska Chapter of the Cure Starts Now, an organization dedicated to funding research for the "homerun cure" for cancer. Jesse's brother Morgan is currently on the road with Team Maddie, 4 cyclists tackling 4000 miles of road across the United States, having begun June 1st in Oregon, and slated to finish in Virgina Beach VA sometime in August. The "Ride for DIPG" has for it's goal to raise $16,000 for DIPG research. 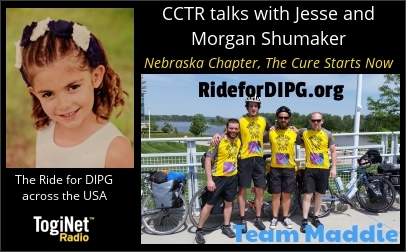 To follow the team and donate to the Ride for DIPG, visit www.RideforDIPG.org. 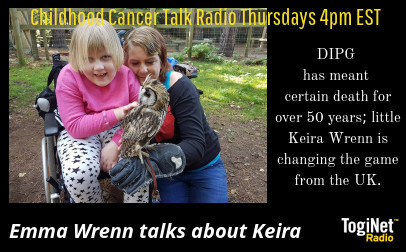 From the UK, Ellie Waters, 15, joins CCTR to talk about her journey with alveolar rhabdomyosarcoma and life as a teen with cancer; her mum Samantha Waters, joins us also. Ellie has a twin sister Olivia, and brother Bailey from her mum's new marriage. and Ellie has 2 step-brothers from her dad's new marriage, so it's quite a large extended family of support and it keeps Samantha extra busy! 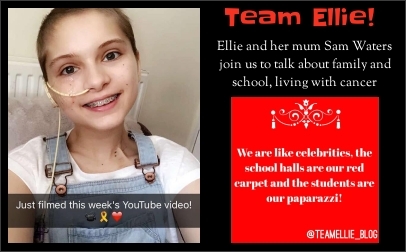 You can follow Ellie's journey at www.teengirllivingwithcancer.blogspot.co.uk, and be inspired by this beautiful and strong young girl's story. 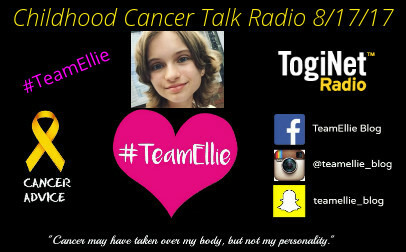 On social media, TeamEllie Blog on facebook, teamellie_blog on Instagram, and TeamEllie on youtube. 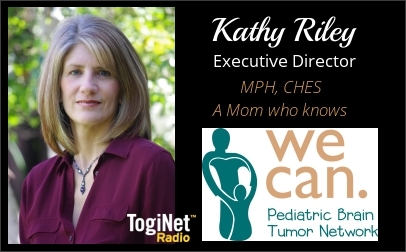 Kathy Riley talks to CCTR about We Can Pediatric Brain Tumor Network, which began 20 years ago with the support and camaraderie between mothers of pediatric brain tumor patients. The support and healing which came from their sharing was so helpful that they wanted to share it with others. The pediatric brain tumor community is small and underserved. Parent-based support is crucial and irreplaceable for families of the newly diagnosed child. Kathy explained how We Can grew and developed to now serve in northern and southern California in providing a number of essential programs of support for children with brain tumors and their families. 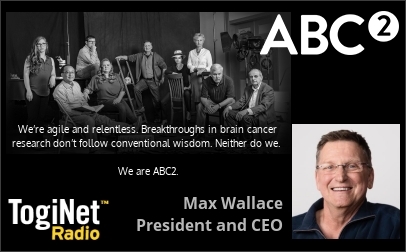 Max Wallace, President and CEO of ABC2--Accelerate Brain Cancer Cure, talks about founder and venture capitalist Dan Chase who had been afflicted with and ultimately died of brain cancer. ABC2 has for a model Dan's genius for taking risks fearlessly and applying the venture approach to brain cancer research and treatment, "The Valley of Death" where such funding is deperately needed, coining the term venture philanthropy.' Max also talks about some of the most innovative and potentially cure-contributing reearch projects which ABC2 is supporting. Visit ABC2.org for more informations. 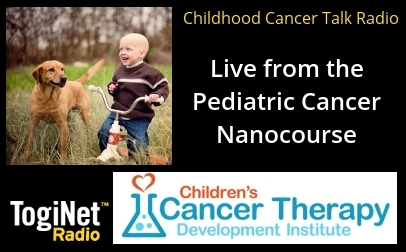 Today's show features creative solutions to difficulties in treating childhood cancer with the Children's Cancer Therapy Development Institute, cc-TDI, devoted to making all forms of childhood cancer survivable. 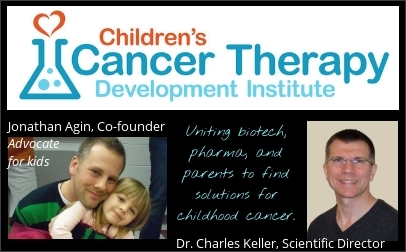 Co-founder, advocate for kids with cancer, and writer Jonathan Agin, and Scientific Director Dr. Charles Keller, talk with CCTR. Learn about a new research project for DIPG, rhabdomyosarcoma; new scientific breakthroughs in procedure and feasibility are highlighted. Stay tuned for Part II! Darkness to light, despair to a single smile...these transformations caused by magical stuffed toy-doggie Owie BowWowie are regular occurrances when he's around! Helping kids and families in their most difficult moments, Owie's comfort brings love and support to children with critical illnesses, and their families. 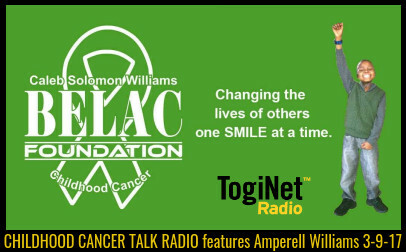 Listen as Owie plans his new debut and launch in the world of childhood cancer awareness! 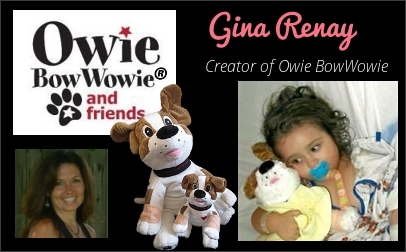 Founder of Owie BowWowie and Friends Foundation Gina Renay explains how Owie came to be, and how he is finding his place in the world. 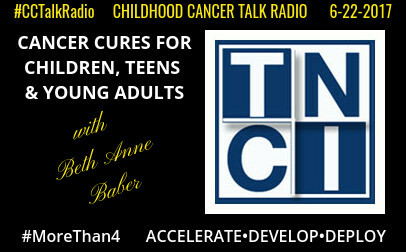 We are on the road, literally, with Childhood Cancer Talk Radio! 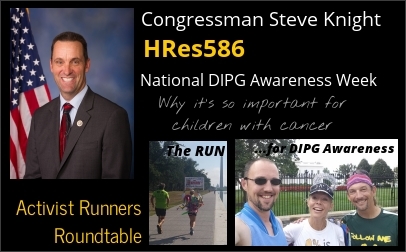 Congressman Steve Knight (R-CA-25) joins CCTR to talk about HRes586, National DIPG Awareness Week, and the importance of the bill at this time--from the author himself. 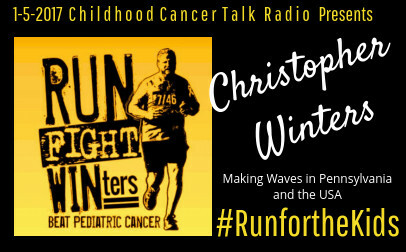 Then we are joined by a runner's roundtable of activists for children with cancer, including John McKay, Brian Jones of the Run for the Whitehouse, and Everett Smith, currently running 200 miles in Southern California for HRes586 and DIPG Awareness. 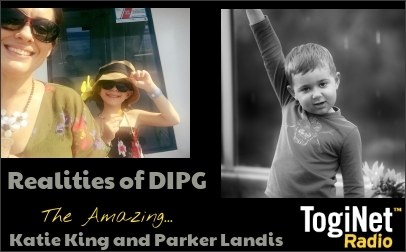 Jaime King, mother to Katie(7), aka Katherine the Brave, and Mark Landis, father to Parker (5), describe the realities faced by parents of DIPG-diagnosed children today. DIPG, diffuse intrinsic pontine glioma, is an invariably terminal pediatric brain tumor with no change in treatment protocol for over 40 years. Parents discover routinely that there are no solutions for their child because, "the numbers aren't great enough for investors." With candid descriptions of the new realities faced after diagnosis, the parents explain how they cope and what they must do to keep going and to understand the meaning of hope. Their voices are a testament for the importance of HRes586, National DIPG Awareness Resolution, advocacy, and change for these children on cancer's literal death-row for kids. 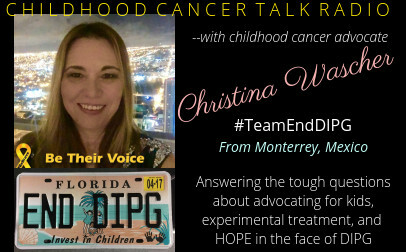 CCTR presents Dr. Kathy Warren, top researcher in pediatric neuro-oncology at the Center for Cancer Research at the National Cancer Institute (NCI), who discusses the history of DIPG research and the nature of this strange and misunderstood tumor, challenges to treatment, and hopeful new lines of research for effective therapies to be developed. We were treated to a brief lesson in pediatric brain tumors by one of the worlds greatest experts on the subject of DIPG, diffuse intrinsic pontine glioma. Dr. Warren stressed the importance in parent advocacy for encouraging world-wide scientific collaboration in the research. 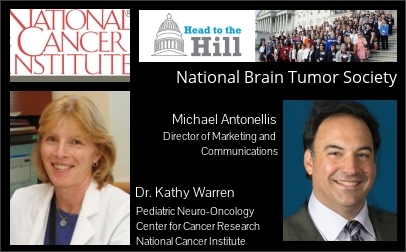 We focused brain tumors and advocacy for the 2nd half of the show with Michael Antonellis, who described the unique opportunities that the National Brian Tumor Society (NBTS) for those called to advocacy, encouraging participation in the upcoming "Head for the Hill Days" in Washington DC. NBTS advocates for the need of research for both adult and pediatric brain tumors, and explained the many differences complicating the treatment landscape. 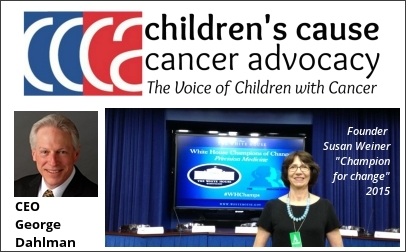 CCTR asks Paul Miller about his extraordinary commitment to speaking out for children with cancer, and about the truth of our medical research system: our kids are ignored, and have been for decades. 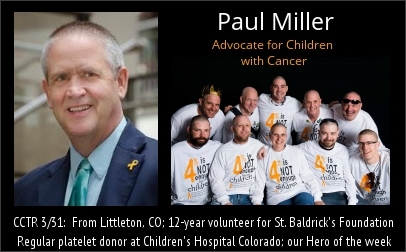 Paul talks about his volunteer work with St. Baldrick's Foundation, which, unlike other large cancer charities like ACS which pays significant administrative salaries, St. Baldrick's is the #1 funder of childhood cancer research with over 80% of it's budget affecting research. He talks about the awareness of this reality that children face--their lives being less important than investment returns to our system--and the prospect of death or a seriously impaired life, and his dedication to those children. "We are their only hope". 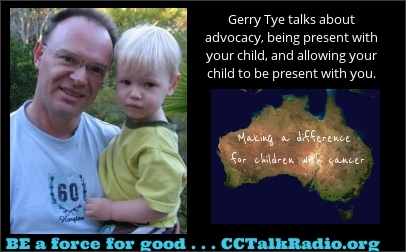 Gerry Tye of Sydney, Australia talks to CCTalkRadio about the experience of an exceptional child lost to an exceptional disease...DIPG is the "Angel Disease" and we hope that the loving, living memory of our children continues to inspire advocacy work for children with cancer and their families that exacts progress where those currently struggling need the support and leadership. The importance of "end-of-life" care and a strategy that protects your sense of decency and humanity. Hope for new collaborations in research efforts to save our children and to insist on prioritizing the fight for their survival. 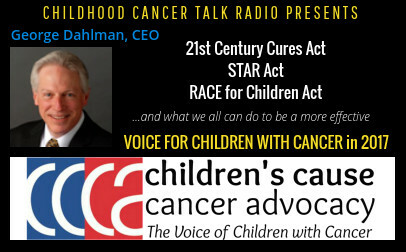 George Dahlman talks about the importance of advocacy in affecting change in legislation and the way our Administration, Congress, and Government Agencies communicate to better accommodate the needs of our children with cancer. 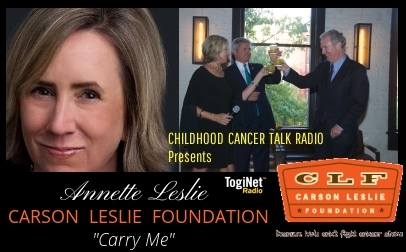 Host Janet Demeter enjoys a rant about the "Great Cop-Out of Capitalism" for our kids with cancer, as numbers are often used as the excuse for the decades of systematic neglect. Hopeful solutions are emerging for seemingly impossible, age-old problems. Peter Brown and Victoria Sardi-Brown tell the story of how their foundation began in 2009 after the death of their precious boy Mattie, 7, who had been diagnosed with osteosarcoma. 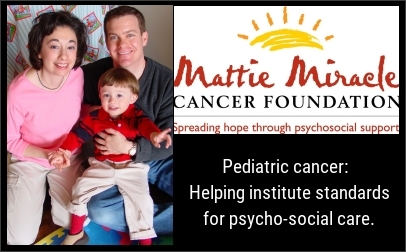 Mattie Miracle Foundation has a powerful advocacy mission emphasizing the need for psycho-social standards of care for children with cancer and their families. The Foundation coordinated a world-wide, interdisciplary project to present evidential experience for the need of these Standards. Their work continues strategizing the implementation of these standards while giving support to families affected by childhood cancer in the Washington DC metropolitan area. CCTR interviews Tracy Ryan, founder and CEO of CannaKids, an organization dedicated to providing the highest quality guidance, care, and cannabis medicine to seriously ill patients, especially pediatric cancer patients. CannaKids was inspired by Tracy's daughter Sophie, who was diagnosed at 8 1/2 months with brain cancer, and is a living testament to the curative powers of cannabis when conventional medicine fell short. Lisa Spedale reveals the heart-wrenching motive for her involvement in one of the most genius technological advancements in the history of neuroscience. Leo Somerville of technology company Renishaw Inc was changed forever by the heart of one little girl, Kira, afflicted with terminal DIPG. 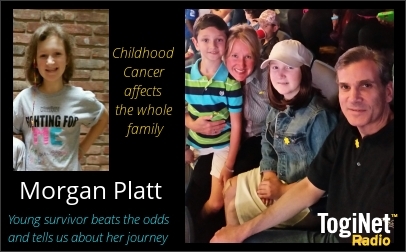 Her brave fight aided the development of a procedure which promises longer and better quality of life for children with DIPG; sadly typical of pediatric cancer, the only barrier is funding. 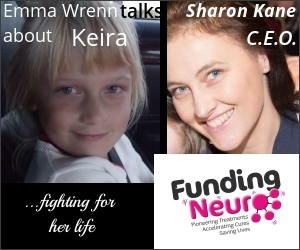 Emma Wren of Alford UK, explains the realities of a DIPG diagnosis for her daughter Keira, and the experimental program with which Keira is involved to combat the deadly disease. Sharon Kane of "Funding Neuro", joins us to discuss the technical details of the procedure and the origins of this research, and Funding Neuro. The fate of Keira's future peers with brain cancer rests upon her pioneering journey. CCTR discusses loss and faith with Lisa DeLong, and how to live, find balance and joy once more. 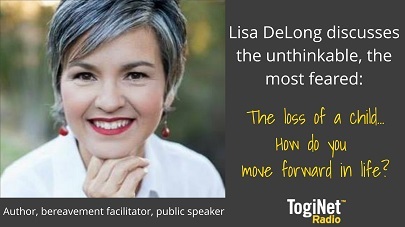 Lisa Solis DeLong, author, nurse, bereavement facilitator, patient advocate, and last but not least--mom!--joins us for a candid discussion of her experience raising two sons with cancer, loss and faith, and how she found new joy in life after losing her son Justin. Join us Thursday, January 28 at 4pm Eastern, right here on Toginet.com. 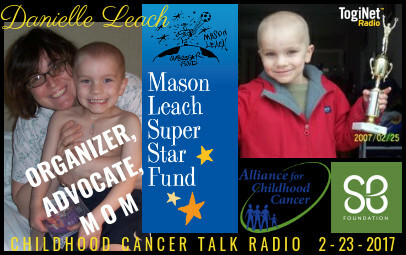 CCTR talks with Ellyn Miller of Smashing Walnuts Foundation for pediatric brain tumor research. Ten-year-old Gabriella Miller was herself a strong advocate for children with cancer, and the inspiration for Smashing Walnuts Foundation; sadly, she passed away from DIPG in October of 2013. The following April, 2014, President Obama signed into law the Gabriella Miller Kids First Act which allocates funding for important pediatric resarch through the National Institutes of Health, to the tune of $12M in the next 10 years. Her legacy is strong throught the continuing advocacy work of her mother, Ellyn Miller, who tirelessly lobbies members of Congress and the NIH to achieve a system that prioritizes cancer resarch for children. Jaime King describes the difficult experience of the terminal diagnosis for daughter Katie with DIPG, the most aggressive pediatric brain tumor. The experimental drug Panobinostat has shown great progress in battling the disease but Katie's time for access to the expensive treatment is running out. Kirstine Wetzel shares her experience with the power of Community and their success in raising funds for pediatric brain tumor research. 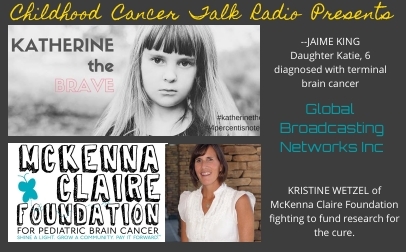 The McKenna Claire Foundation gives support to families like Katie's in the unending battle to raise awareness for the urgent need for a cure.